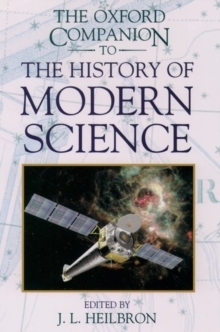 From the biographies on Galileo and Dorothy Hodgkin to the discussions chronicling the change of science from simply a tool of learning to a major force in society, The Oxford Companion to the History of Modern Science is the most comprehensive one-volume resource on science from 1550 to the present. Along with chemistry, physics, and biology, the major scientific disciplines are represented in this alphabetically arranged work including astrology, ethnology, and zoology, among many others. General concepts such as gender and science and scientific development are explored along with major time periods that had a tremendous impact on the field including the Enlightenment and Globalization (post-World War II). The coverage is not limited to just one geographical area but is worldwide,tracing science from its traditional centres and explaining how non-western societies have modified and contributed to its global arena. Major divisions of thought including Aristotelianism and mechanical philosophy are also covered as well as an examination of science and its relationship to professional practice and the changing face of disciplines and sub-disciplines. Individual institutions such as CERN and the Third World Academy of Science are explored as well as the epistemology and methodology of scientific knowledge, theoretical constructs, information on apparatus and instruments, the social aspects andresponsibilities of science, and the innumerable uses of the applied sciences. Over 90 biographies bring these fields to life with the stories behind the great achievements. Among the notable scientists are Linus Pauling, Margaret Mead, Niels Bohr, Albert Einstein, and Edwin Hubble. An excellent overview of the field of science and its development over the past few generations, The Oxford Companion to the History of Modern Science is an essential resource for students, historians, teachers, scientists, doctors, engineers, and anyone with an interest in the many and varied aspects of science.